More than 30 participants from 21 centres attended the meeting. The meeting was also attended by the representatives from the Permanent Missions of various countries that are hosting the Regional Centres under the Basel and Stockholm conventions. 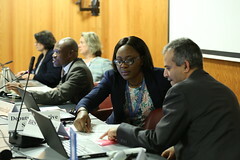 The two-day meeting was dedicated on following up on the decisions adopted by the 2017 COPs of the Basel and Stockholm conventions, particularly on how to enhance the effectiveness of the regional centres in implementing various mandates by COPs, challenges and opportunities linked with these mandates, among others. Also discussed was BRS Technical Assistance Plan and its monitoring and evaluation, Activity reporting and the preparation for the performance evaluation of the Centres, procurement capacity assessment of the regional centres, clearing house mechanism, etc. The meeting was followed by a half day training of the directors on the gender mainstreaming.